Coral is a well-established brand in the gambling industry whose roots go all the way back to 1926. It is considered to be one of the top bookmakers in the UK and is part of the Gala Coral Group. The Coral sportsbook is licensed in Gibraltar and in the UK, so this is definitely a safe place for punters. Even though it took Coral a while to launch an online site, they have made up for this in recent years. In fact, in 2012 the interface was re-launched. The present Coral sportsbook offers a large variety of markets. In this Coral review, we will analyse various aspects of the online gambling provider, such as the payment methods offered, the betting odds and, of course, the Coral Welcome Bonus offer. Place a 35 GBP bet on any sport at odds of evens (2.0) or greater from Monday to Thursday and you will you will receive a 5 GBP free bet on Friday. Simply place a winning accumulator on selected pre-match football markets and we’ll boost your winnings by 10%, paid as a free bet up to £/€100. Place a Virtual Sports bet at Coral and you´ll recieve a 20 GBP free bet. Coral was founded by Joe Kagarlitski, aka Joe Coral, in 1926. At the beginning, the bookmaking business focused mainly on horse races. In 1961, when the new British legislation made betting legal, Mr Coral was one of the first to open a betting office. Nowadays, Coral has over 1,800 betting shops in the United Kingdom. In 2011, the gaming division was moved to Gibraltar, where it is currently licensed. In addition, the sportsbook is regulated by the UK Gambling Commission. According to our Coral review, Coral is the owner of greyhound racing stadiums in Romford and Hove, England. Our Coral review will take a closer look at the Coral Welcome Bonus for new customers in the UK and Ireland. 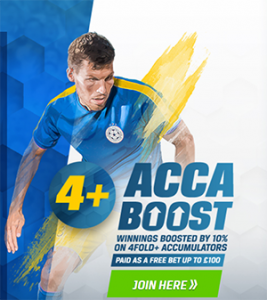 For this sign-up offer, newcomers get four (4) free bets of five (5) GBP. In order to obtain this Coral bonus, you must sign up, make a minimum deposit and the first bet you place must amount to 5 GBP. This must be a win or each-way bet at odds of 1/2 (1.5) or greater. You have 14 days to fulfil those requirements after registering. Once the qualifying bet is placed, your free bet tokens will be available in your account. You then have 7 days to use them. The 4 x 5 GBP free bet tokens must be wagered in full and can be used on the following types of bets: single, double, treble, 4-fold and upwards accumulator, as well as forecast and combination. There is no promotion code for this Coral free bet offer. Make sure you get the full bonus amount by following the following tutorial provided by our Coral review. Step 1 – Registration: Go to the Coral website and click on the green “Join now” button in the top right corner. Fill in the registration form with personal details as well as username, password and security question. Step 2 – Making a deposit: Click on the deposit button and select the payment method you prefer. Skrill, PaySafe or Neteller are NOT eligible for the bonus offer. Enter the currency, amount (minimum 5 GBP) and confirm. Step 3 – Fulfil the welcome bonus conditions: Place your first bet of minimum £5. This must be a win or each-way bet at minimum odds of 1/2 (1.5). You have 14 days to do this. Step 4 – Use the free bets: As soon as your qualifying bet is placed, the free bet tokens (4 x £5) will be automatically credited to your account. These must be used within 7 days or they will be forfeited. Free bets can be used on singles, doubles, trebles, 4 folds, ACCAs, forecast and combinations. Our Coral review was pleased to see that this bookmaker constantly has incentives for existing customers as well. By clicking on the Coral “Promotions” tab on the homepage, you will be redirected to a list of current offers. An interesting promotion is called Coral Football Jackpot. You can win a prize worth £100,000 by predicting 15 correct match results from a list of 15 each week. If you only guess 13 or 14 correctly, then you will share the winnings. You can also opt-in to the Coral Bet & Get Club when you log in to your account. If you stake £25 on any sport at odds of evens (2.0) or greater (from Monday to Thursday), you will receive a £5 free bet on Friday evening that must be used during the weekend. Football is undeniably the most popular sport that is bet on across the globe and this is no different at Coral as our Coral review found. This bookmaker has an extensive range of football odds and markets. Even though the focus might be on UK and Irish leagues, you will find also find markets ranging from the English Premier League to the UAE Arabian Gulf League. Traditional sports markets such as tennis, greyhound and horse are also present. Furthermore, the variety of bet types is truly outstanding. Of course, traditional ones include single, each way single, double, treble and accumulator bets. What is more, the football market also offers transfer, player, manager and team specials. If you prefer in-play betting, then you will find access to this section by clicking on the “Bet In Play” tab directly on the homepage. Coral also offers cash out options like other well-known sportsbooks. Moreover, live streaming is offered for a large number of sports events. With regards to betting odds though, during this Coral review we were a bit disappointed by the fact that this bookmaker does seem to have slightly higher profit margins than some of its competitors. The Coral margin on sports is almost 6%. As this Coral review shows, Coral is a bookmaker where punters can feel at home. Especially if you are a fan of UK and Irish sports, this is the right place for you. There is a broad and deep selection of bets in different sport markets, even though the focus might be more on European sports in general. There are different ways to contact the support but the live chat is not available 24/7. The Coral bonus offer might not be very exciting, but it can easily be obtained. The variety of payment methods is more than sufficient and Coral even offers its own option: Connect. Unfortunately, players in a number of European countries cannot bet at Coral. The traditional bookmaker might need to improve this, to attract more customers. Overall though, Coral makes a good impression. Coral offers a wide selection of payment methods to fund your betting account and they are all free of charge. You can deposit money using your MasterCard or VISA debit/credit cards, several e-wallets (Neteller, Skrill, PayPal, Eco) and of course Connect (Coral). According to our Cora review, funds are instantly deposited and the deposit limit amounts to £5 in most cases (except PayPal: £10). Step 1 – Go to the banking section of your account: Log in to your Coral account and click on “Deposit” at the top right. Step 2 – Select the desired payment method: Choose among the payment options. Enter the amount and currency. Step 3 – Transact: Complete any necessary details required by the payment method in question and confirm the transaction. Your money should be available right away. Punters usually use the same method for depositing and withdrawing. This is also preferred by bookmakers because if you end up choosing a different method, your identity must be verified. For debit/credit cards, e-wallets and Coral Connect, the minimum withdrawal amount is 5 GBP. Once again, there are no fees charged for those transactions. The processing time for e-wallets takes up to 24 hours, whereas for debit and credit cards, this can last 2 to 5 working days. The fastest withdrawal options are Connect and bank transfers. Coral offers all the usual channels to reach the customer service. If you cannot find a satisfying reply to your queries in the FAQs, then use the telephone hotline in English which is available 24/7. Just dial 0800 44 00 11 (UK), 1 800 995 977 (Ireland) or +44 208 507 5544 if you are calling from abroad. Coral is actually one of the few bookmakers that offers a call-back option. You can also write to Coral by using the e-mail form located in the contact section. Moreover, there is a live-chat option once you are logged in. Unfortunately, this support method is only available from 7:00 am to 11:30 pm. With almost 300.000 followers on Facebook, the sportsbook is definitely present in the social media. In addition to news, guessing games and the like, Coral often has special offers for its users. During the Coral review, Facebook followers had the chance to get £75 in free bets to celebrate the World Cup Draw Day. The bookmaker also has a Twitter account @Coral where it not only publishes current sports news but also advertises website offers. Reliable or scam: How safe is Coral? Our Coral review did not encounter any security issues here. The sportsbook, which has been in business since the 1920s, uses encryption for data transmission, thus protecting your sensitive details. The terms and conditions are transparent so there are no dubious business policies. In addition, Coral is licensed by the Government of Gibraltar and regulated by the UK Gambling Commission for customers accessing Coral.co.uk from Great Britain. The bookmaker is also a member of an alternative dispute resolution service called IBAS (Independent Betting Adjudication Service). How can I register at Coral? You can sign up at Coral with just a few clicks. Once you are on the sports site, click on the green “Join now” button at the top right. The Coral registration form will open and you fill in the necessary details such as your name, birthdate, address, e-mail, username and password. Once this is done, you will be given the chance to deposit funds into your Coral bet account. Joseph Kagarlitsky, known as Joe Coral, founded Coral back in 1926. He set up his first betting pitches at the Haringey and White City greyhound tracks. When the UK legalised and regulated the off-course bookmaking market in 1961, Coral Retail was formalised. What is the Coral Cash Out feature and how does it work? This live feature is offered to Coral customers. It means that a bet can be settled before the event that has been bet on has finished. There is a Cash-Out button that you must click on if you wish to profit from this offer during a match or race, usually located right under your bet. Coral Connect is a payment method offered by the bookmaker. For example, you can deposit your funds online and bet in your local Coral betting shop and vice versa. Our Coral review noticed that one benefit of using the Coral Connect option is the possibility to claim your winnings as soon as a bet is settled, whether online or at your local Coral shop. How do I deposit at Coral Sport Online? Making a deposit at Coral sport online is not difficult. Simply log in, click on “My Account” and then go to “Deposit”. You can then proceed by selecting a method of payment, fill in the required information and confirm your transaction. Your funds are automatically deposited.